I2C arbiter chip application(PDF) from NXP. The PCA9641 is highly integrated and smart design for 2-1 I2C-bus multiplexer. It is used in a system that needs two masters sharing the same slave devices. The internal switch is programmed by the masters but it will not switch in a middle of the task once owned by the master. The PCA9641 sends an interrupt to the master requesting the bus when the downstream bus is available. If the down-stream bus is hung, the initial/recovery function clears the downstream bus and sends status to both masters. 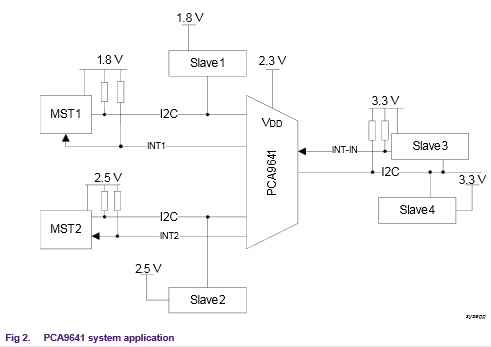 Low voltage I2C masters can communicate with higher voltage level of slave devices. This entry was posted on Sunday, November 2nd, 2014 at 1:00 pm	and is filed under app notes. You can follow any responses to this entry through the RSS 2.0 feed. You can skip to the end and leave a response. Pinging is currently not allowed.